It seems China’s housing bubble also burst young Chinese couples’ marriage plans in the country as some 10,000 people polled by a local daily, revealed wedding plans, have been shelved recently because they still cannot afford homes of their own. Home ownership is a prerogative before marrying in China and although prices had been on a decline, an ordinary worker earning an average 4,500 yuan a month could still not afford mortgage payments for a Beijing-based apartment with mortgage payments of no less than 7,000 yuan a month. First-time buyers are required to put up 30% as minimum down payment for brand new homes. Second home buyers need to shell out 60%. Mortgages for subsequent purchases were also disallowed. There were also new property taxes imposed in cities Chongqing and Shanghai were some lucrative jobs can be found. Chinese authorities have not relaxed tight controls on the property sector, although some policy easing on economic policies have begun. Buyers are still limited to what they can buy triggering major price declines in key cities. 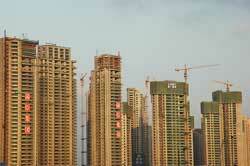 In January, home prices in 47 Chinese cities fell, according to the National Statistics Bureau website. Chinese authorities may start easing property policies in the fourth quarter of this year, according to Hong Kong based economist Ting Lu at Bank of America-Merrill Lynch, noting that the government would not want drastic changes soon.